Travelling North on the A6, and about two miles South of Milnthorpe, Beetham Hall is easily visible from the road. 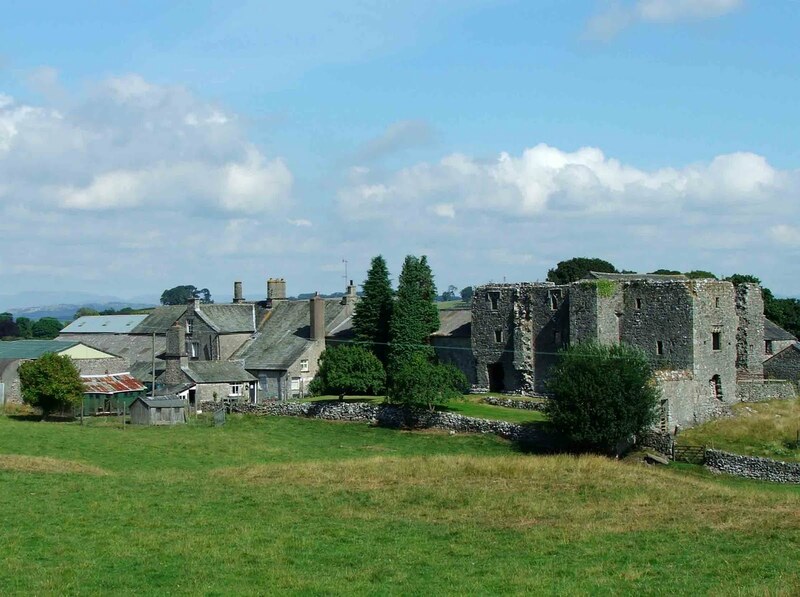 The remains of this magnificent medieval hall are still incredibly numerous, with a tower, chapel, hall and out buildings surviving from the 13th century, mixed in with later buildings and barns. Above. A view of Beetham Hall from the A6 to the South East. Although the hall is privately owned, I think the owners are aware of the interest that such a building has for members of the public. As well as being allowed to freely roam the site on the day I visited, there are small signs dotted around the interior of the buildings stating what function they used to have. I understand that the property is owned by the estate at Dallam Tower, which also owns Heversham Hall. Above. Part of the curtain wall. As you approach up the drive from the main road, the first thing that you come across are the remnants of the curtain wall, or barmkyn. To the right of the drive these remain to around 15 feet high in some places, with loop holes still visible in much of the remaining wall. At around a foot and a half thick in places, the curtain wall would have provided good defence against a small scale raid or attack. The wall’s route to the left of the site of the original gatehouse is now built over by a late 18th century or early 19th century barn. In fact, most of the curtain wall to the left of the driveway has long since been built over, with the only remains left protecting the corner of the courtyard. The curtain wall to the rear of the site has been destroyed, as has the portion that would have run along the North West side of the courtyard. Some of the wall’s remains have possibly corbels at the highest point. It’s been suggested that a wooden wall walk may have been built onto these supports. Above. Interior of the courtyard showing the curtain wall. Once in the courtyard the farm house is the first building to be seen, directly in front of you. This building dates from the 17th century, possibly 1693 or 1653 (the date stone is well worn) and was originally built for Thomas Brabin. Above. Chapel window and piscina. To the left of the house, and to the South of the courtyard, lays the remains of the Great Hall. This building would once have been the centre of the hall, and is 40 feet by 25 feet in size. The hall was lit by huge windows dating from the 14th century. Above. Window in the old Hall. They are still in situ, but most have been blocked up, probably to stop the sandstone supports from falling out. The left of the hall are the remains of the buttery wing, now much in ruin. These remains have Western walls from roughly the 14th century, and on the East, walls of a 17th century nature. Above. The South facing window in the chapel. To the right of the hall lays the solar wing, the Lordly living quarters of the whole complex. The solar is a two storey building, once four storeys, now roofless, with a small chapel on the first floor. The fine end window can still be seen in place, with sandstone arch heads. In the wall of the chapel a small piscina can still be seen embedded in the wall next to a small single light window. Above. The solar tower at the South of the complex of buildings. A door leads from the solar wing to a modern terrace that overlooks the fields to the South West of the complex. Here the outer wall of the solar wing shows considerable damage, with the huge cross walls damaged to about head height. All the windows are in situ and open, bar one, which has been bricked up. The hall was certainly built in the early 14th century, and has been continually added to over the years. After 1485, the lands at Beetham were forfeited to the crown when the Betham\Bethum family were found to have backed the Yorkist army at the battle of Bosworth Field. Henry VII granted the estates to the Stanley family in recognition of the fact that they had deserted the army of Richard III and joined Henry VII’s army, influencing the outcome of the battle in Henry’s favour. Above. Another view of the chapel. The hall was once again involved in political intrigue and royal jousting when it was besieged by Thomas Fairfax in 1644 during the civil war, suffering damage at the hands his forces. It’s not known what amount of damage was caused by this attack, but the hall was partially rebuilt in the 17th century. Above. Beetham Hall from the South. Above. Another view from the South. 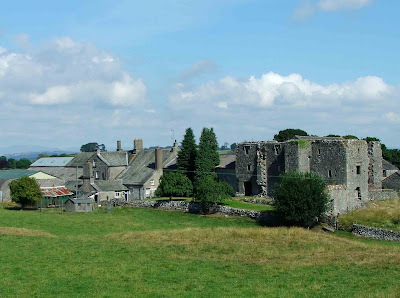 Eventually it passed into the hands of the Cliffords (like many castles and towers in the Westmorland\Cumbria area) and then eventually into the hands of the Wilsons of Dallam Tower near Milnthorpe in 1767, and under who’s ownership it remains today. Above. The solar tower from the West. Although this is a private property, it can be seen clearly from the road side (A6) and also from a footpath that runs behind the property. Excellent views can be had from both vantage points. Am I looking at my ancestral home? I have a watercolour painting of Beetham Old Hall Farm. Is this farm & buildings still there? My Grandfather farmed here and my Mother grew up here and still lives in Hale. The buildings still stand and look magnificent! I have walked past it several times in the past 12 months and hope to do a 'proper' visit if I can get permission.